I guess for myself fishing was born into me, my Grandfather and Dad were both snapper fisherman, growing up I spent a lot of time fishing the waters of the Spencer Gulf in South Australia, fishing off the local wharf and jetties for whatever would take my bait. When I wasn’t wetting a line I was talking to my Dad and Grandfather about fishing or making out I was fishing while the boat was parked in the back yard. I can still remember getting excited when Dad would come home with snapper in the back of the old family car from one of his overnight adventures. In my teen years the family packed up and moved away to the country, my fear of not being near water never came though as we had moved to a small town in the Adelaide Hills with freshwater creeks surrounding it. I found a passion for freshwater fishing, my weekends would consist of leaving home on foot early morning and not returning till dusk, exploring the local water ways, even if it meant I had to walk for miles to find new water. I spent many years finessing my techniques fishing for Redfin and Trout on light gear, and also pulling mud monsters from the banks of the Angus River, Finniss River and Lake Alexandrina. I can count on 1 hand the amount of trips I come home with no fish landed. Growing up I eventually moved down to Adelaide, buying a car and a boat which opened up my saltwater fishing experience once again. 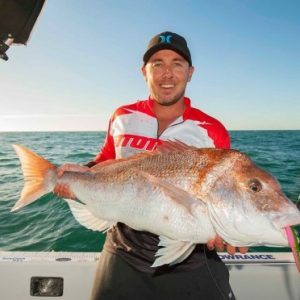 Many hours were spent fishing the Port River for the elusive silver ghost, bread and butter fishing and getting back into the Snapper which is what South Australia is renowned for. Travelling all over the Gulf St Vincent in search for the “ Big Red “ was not uncommon for me. In 2007 I finally got the big snapper I was looking for, fishing off the waters of Ardrossan, from that moment I was hooked on these fish, BIG TIME. Many hours were invested waking up early, sleeping at boat ramps or in the boat soaking baits for these amazing sport fish. Snapper now takes up most of my fishing time, but I will admit, I still love fishing for my bread and butter species and now invest time in my family teaching them how to fish and enjoying what the water has to offer. So with that said, if you see me on and around the waters in SA feel free to come up and say hello, I’m always up for a chat, if it be about fishing and the gear I’m using. I would also like to thank Frogleys Offshore for giving me this opportunity to represent their amazing product range. If you want to know more about these amazing products or fishing around South Australia look me up on Facebook.